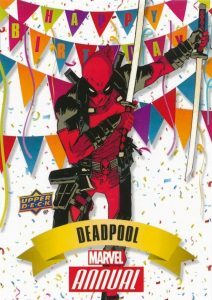 A new approach from UD Entertainment, 2016 Upper Deck Marvel Annual summarizes the year in comics within the Marvel Universe. 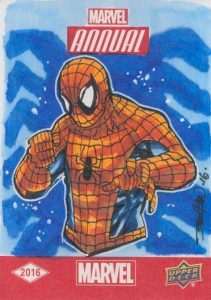 Each hobby box includes one patch, sketch, plexi-sketch or premium insert. 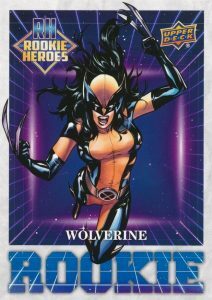 Forming the bulk of the release, 2016 Upper Deck Marvel Annual features a 100-card base set as well as 50 short prints. 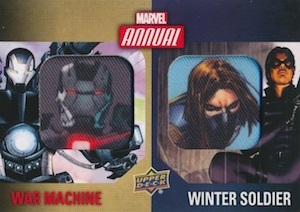 Printing Plate inserts are unique issues that were actually used in the production of the set. 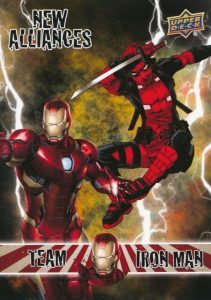 In addition to 11 standard inserts like Rookie Heroes and Plot Twist, 2016 Upper Deck Marvel Annual boasts plenty of the quality hits that collectors have come to expect. 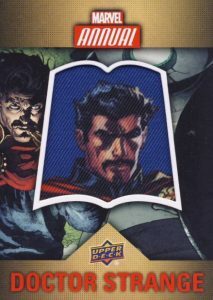 Manufactured patch cards extend to Single Character Patches and Dual Character Patches, which also have Short Print (SP) options for each set. 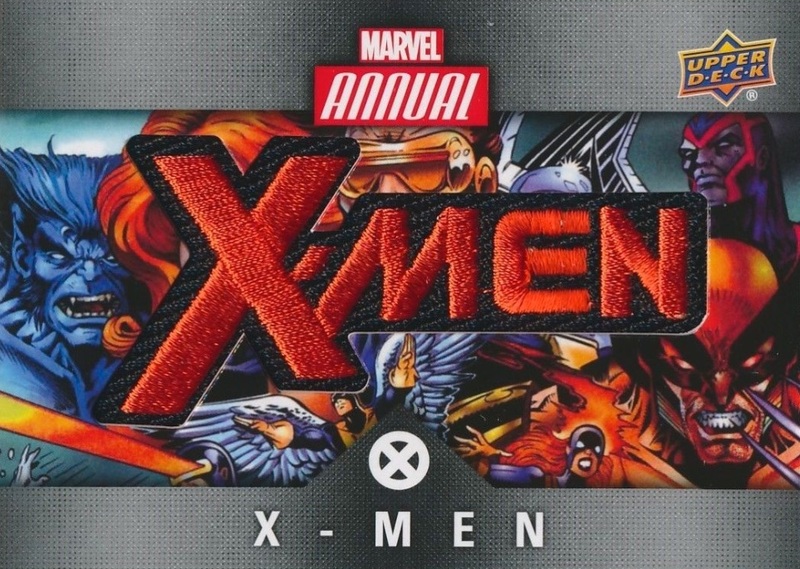 Team Logo and Team Name Patch inserts look at the larger Marvel entities with other commemorative relics. More unique, Die-Cut Plexi cards are just as they sound with a thick, plastic stock and a distinct shape. 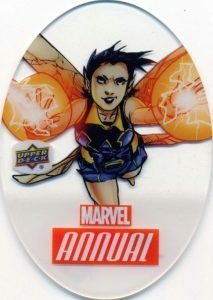 Finally, standard one-of-one Sketch cards and limited Plexi-Sketch cards, which include artwork on clear plastic, round out the choices in 2016 Upper Deck Marvel Annual. Overall Odds: Base (#1-100) - 4 per pack; Base SP (#101-150) - 1:4 packs. PARALLEL CARDS: Gold, Red, Printing Plates 1/1. 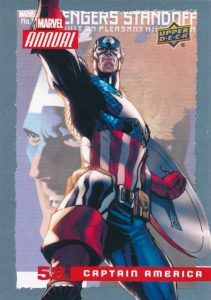 Overall Odds: Base - 1:80 packs; Comic - 1:240 packs. Overall Odds: Base Patch - 1:69 packs; Patch SP - 1:240 packs. 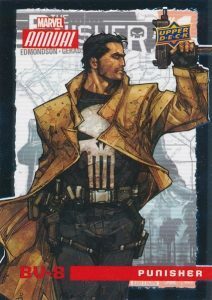 Overall Odds: Base Patch - 1:96 packs; Patch SP - 1:285 packs. Thank you, Trey, for the checklist. This set is, for me, is thoroughly disappointing. 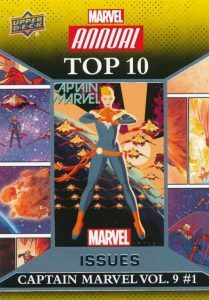 Spectrum was included, but how could Marvel/Upper Deck gloss over Blue Marvel, Ms. America Chavez, Galactus- the Lifebringer, or the stories of The Ultimates? 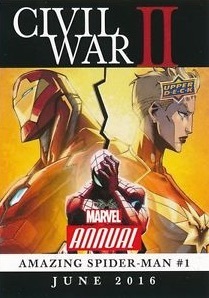 They were all part of Civil War–Captain Marvel and Black Panther are group members. 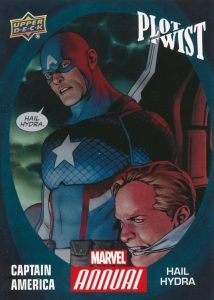 Marvel promotes this series as their preeminent Avengers series. 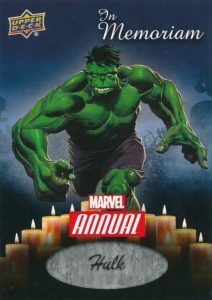 Do you have information on how Marvel made the decisions to include and exclude what they did for Annual 2016? We only know what the sell sheet and checklist provided. Honestly, there really has not been much coverage for this set that I have seen. Great work, Trey, thank you! How rare is the set as a whole, meaning how available are these boxes in relation to past hobby boxes? Scott: Production is unknown as Upper Deck does not normally reveal this sort of information.